I'm a sound designer, mixer and composer working in game audio and post audio. The rest of my notes are regarding the scripting part of his talk. They're pretty inane (my notes, not Marc's talk). I recently read a comparison between Python and Lua that seemed to indicate that because Lua has a smaller footprint, is faster, uses less memory and was designed intially as a configuration language it is well suited to games in general - I believe it gets used for audio scripting a bunch. I honestly can't remember if these were my take away's from Marc's talk or things he actually said. I mean, they're all good things to do and definitely on my distressingly long post GDC to do list. But the most quotable thing that Marc said was a riff on a post audio quote that I've heard attributed to both Spielberg and Lucas - the old "film is 50% sound" chestnut. Marc's take on that was "Game Audio is 50% implentation. Tattoo that on the back of your eyelids"
But let's be realistic. This is audio. When is there time to even close your eyes? GDC 2015, Dialogue 101 notes. Another talk I wasn't planning on attending. With over 15 years post experience I've done just about everything dialogue related you can think of, and I wasn't sure that even Michael Csurics . Recordist, re-recording, processing, ADR, editing, directing, I've even spent a bit of time on the other side of the glass. Fortunately, I get a perverse kind of pleasure from being proven wrong, probably because it usually means I get a chance to learn something. So right out of the gate, Michael starts talking about casting. Whoops, I've never done that before. Climbing off of a high horse is difficult, but fortunately the conference rooms at the Moscone center are relatively spacious, so I'm pretty sure no one noticed. The lines don't have to be from the script, but they should be something that an actor can really show their idea for the character with. IMO the lines should also be where that character "lives" in your story (reluctant hero, naive sidekick, bitter but sage veteran) and emotional range. Further to that, I would also add that if you're doing callbacks that might be a good time to have your actors read lines where there characters "turn" or do something against archetype or seemingly out of character. Obviously great writing goes a long way to make such moments believable, but story setups get cut, and if you have an actor that can really sell those moments where a charcter turns a sharp corner in their development or acts in a way that is seemingly inconsistent with their core values, that's worth its weight in gold. Get your actors to read Onos / onomatopoeia lines. Some hits (tense jaw, tight core) some getting hit (mouth open relaxed, core not engaged) some pain / death screams. If a character has a lot of systemic dialogue, there's no point in hiring someone who can deliver good Ono's. Its really immersion breaking for players. That non union rate looks high to me, as its the same as ACTRA. My guess would be 100/hr 2hr min is accurate and that I've made a typo in my notes. This is going to vary by region and city, but that's a good benchmark. In Toronto you should be able to get a good room for about a grand a day, especially if you're booking a bunch of sessions. Don't book a studio without visiting if you can help it, visit first see if the space feels comfortable. I'll add here, that an especially dead room doesn't really present any technical problems. In fact, a really dead room is great for screams and any loud sounds which excite a "live-r" room and generate a lot of reflections that get picked up on mic. Not having any room reverb makes it easier to "sell" stuff as being outside. However, a really dead room can be difficult to work in for actors. A dead room sounds and feels unnatural, which is just one more thing taking an actor out of their character, scene and imagined environment. By and large, technical considerations should come second to performance - the whole point of recording VO is to capture a performance, so the technical considerations should always be in service to that performance. To that last note, I would add save your Onos for the end of the systemic dialogue, with death screams (and screams in general) coming at the end. I would also add to make sure that you have scripts ready for everyone else on the team at the session. Plan for script for the recordist, her assistant, the actors, yourself and anyone else working "behind the producers desk" (producer, your assitant, the writers, narrative director, voice designer etc). You should also be at least perihperally aware of the workflow (intimately, if you're the engineer, assitant, voice / narritive designer) and be sure that everyone is on the same page for deliverables, naming convention and file formats. I can personally attest to getting better performances when the director is on the floor with the actors and when the actors have someone else to act off of. Also nothing interupts the flow of a session more that when the director doesn't know the intention of the scene - if its not possible to read through all the scripts and have a meeting with writer before the session, the writer needs to be at the session. Okay, that's all for today, tomorrow I'll tackle both technical sound design and systems in Sunset overdrive. So the second talk that I took copious notes for, was from Richard Ludlow of hexanyaudio.com. To be perfectly honest, I had no interest in staying for this talk. None of the amazing gigs I've been lucky enough to get have been through networking, they've been through friends, or more precisesly, friends I've made through work. There isn't any magic formula for "getting" gigs and networking events that purport to do that seem to be selling relationships as a means to an end. No thanks. So. I'm ready to go soak up some SF sunshine when Richard says (and I'm paraphrasing) "When you're at a GDC party, social or networking event, don't go looking for a gig. Look for someone you might want to be friends with. Talk to those people. If you hit it off, those are the people who someday, may call you with work". This really resonated with me, and it's how I now approach all potential "networking" events. Not as a chance to find work. But as a chance to find someone that I like, can hang out with, and therefore, might want to work with. But Richard's talk wasn't all friendship braclets and holding hands. Once you have a meeting with a potential client, he had a list of things you should suss out in the initial meeting. He recommended start off with casually asking questions - I would also reccomend doing some googling so some of these aren't straight up questions, but talking points you can bring up. IMHO that's a mouthful to ask casually. So do some homework on the client first. RIchard then reccomends getting down to question about the game. • what's the development cycle like? • what is your timeline for audio and ship date? • how many main characters? • how many SFX assets? • Is there narration? Budget for casting and VO and ACTRA? • Is there music interactivity? • are you interested in using a middleware solution or implemenatation servicies? • do you want live players? • do you want to music to be a work for hire or do you want to license the music? • are their cut scenes & trailers that you want my services for. And finally the questions everyone hates to ask - budge. If it seems appropriate (ie they ask you what they should spend on audio) ask them what the budget of the game is. Now at this point in my career, I usually get told that I have the gig or I don't. But Richard says this is where you make a bid. It should include a cover letter, propsal, and cost breakdown. • creative proposal - get them excited about what you want to do for the game, include detailed ideas about music and sound and specific about implementation, as well as cost details. • cost breakdown - keep this all modular. music can be broken down by themes, arrangements, transitions, stingers. SFX by primary sounds, UI, ambiences as well as number of iterations. Dialogue can be broken down into casting, actors, direction, recording, and line processing. Finally, although Richard didn't address this in the talk, I emailed him about mix and implentation costs. Based on his response you may want to roll mixing and middleware implentation costs into your other assets - asking a client to pay for both the middleware licsense and for you to use it to implement can seem like insult to injury - same goes for the mix. Seeing as when you throw assets over the fence it can ruin the sounds (and your reputation), I'd be willing to try and find a way to absorb mixing and implementation (if the implementaion begins and ends at the middleware) depending on the project. However, if assets are to be implemented directly into the engine, that's definitely something you can charge for, preferrably at an hourly rate. Richard also reccomened sending two quotes, one as music for hire, one as licensed music. This seems to revolve mostly around music, after you've been offered the gig. Sorting out the copyright is very important, obvs. So is having a clear handle on what exactly is being delivered, and how much of it. Also having a rev limit, and some discussion about what contitues a revision, and what constitutes a "change order" - ie an entirely new piece of music with a new style / emotional content / pallet. I'd also personally have an agreement esp with work for hires, about who owns rejected content. Having specific talks about both composer rights and developer rights are crucial. Finally richard also mentioned that audio style guides are for short conversations, but uh, I didn't include any examples in my notes... He also said that for an in depth coversation, dig deep and ask for six tracks that appeal to the dev for this project. Once you get those tracks, send a couple of tracks back to the devloper based on your discussion, and get some detailed feed back from them. I'm sure that Richard probably said something about how to keep clients, or maybe he ran out of time. So I'll leave you with this nugget: you can be brilliant, easy to work with, and meet your deadlines - to keep working you have to be at least two of those. This year I was fortunate enough to go GDC and attend the audio track. I took copious amounts of notes in point form, so I figured I might as well share them here. Some of them may not be entirely comprehensible, hopefully I can figure them out as I go along. Points marked with a "•" are basically what my notes where. Anything with a "-" is me trying to explain my note post-hoc. The first talk I attended was Sound Design the Bungie Way, by Jay Weinland. • Enemy guns had two basic variation sets, distant and close. Because the vast majority of gun play happens at the middle distnace they made the decision not to change between distant and close sound at the mid point, to much switching between sounds all the time. Instead they crossfaded into distant sounds further away. For the mid range, they used the close sounds with some HPF and LPF. - So the way I understand the silence plugin to work is that WWISE just looks at the level it is set at as opposed to analyzing the sound it is at. By making it super short, setting its level to the max and having it play just before your explosions in an explosion event, you can kill all other sounds faster that you can hear them cut out giving room for the explosion to really cut through. • Instead of a long continous loop, rocket by's were treated as long one shot sound that played in proximal relationship to the player. If the rockets were fired very close to the player, the audio engine would seek into the middle of the pass by audio file, quickly fading up. - I followed this conceptually, but Jay didn't have time to get into how it was scripted. - I litteraly just remembered that "scopes affecting pan" refers to using a separate mixing state for each gun scope and narrowing the pan to help the feeling of focus for looking through the scope. Okay, with any luck, I'll be able to summarize another talk for y'all tomorrow. I recently had to come up with a way to rename simple file names to more complicated file names from a spreadsheet on a Mac. It occurred to me that for those of you without Soundminer this technique might be useful for renaming SFX. Sometimes when you purchase a library, the file names are simply unique identifiers (like SD12321.wav), and the descriptive comments are included in an accompanying spreadsheet. By fiddling with the method below, you should be able to replace the original file names with the descriptions, allowing you to use the Finder to search them. echo "Renaming $OLD_NAME to $NEW_NAME"
NB: if you comment out the second last line with a hash #mv $OLD_NAME $NEW_NAME terminal will echo all the file changes for you without actually renaming the files. `After purchasing my pair of DPA 4060's a while back I have been planning on building a DIY binaural rig. While I have a method for using the DPA's with my own ears a stealth recording rig, this isn't always the best way to go. 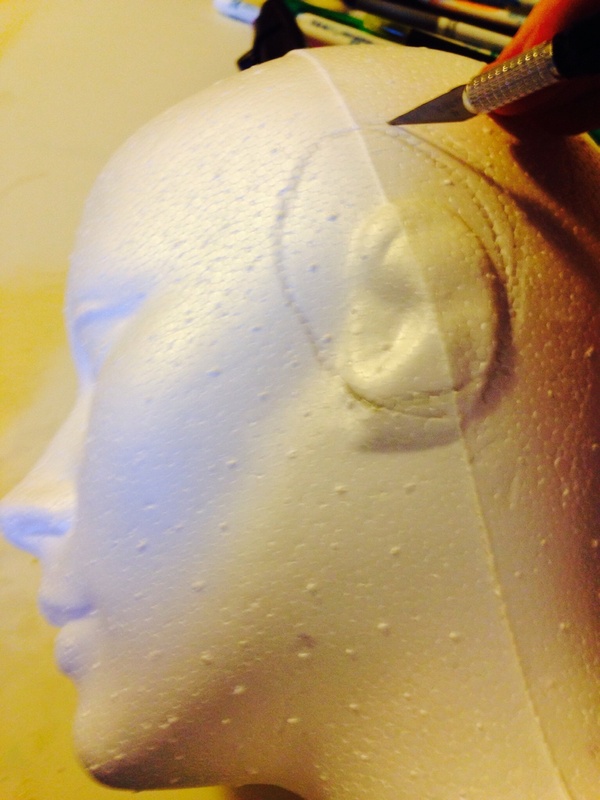 I started by tracing out the ears and cutting to the depth of the silicone mount. There's already a hole in the mannequin head that runs thought it, perfect! But I'm drilling a hole in the back neck so I can run the cables out there and use the hole at the bottom for a stand mount. I elected not to glue the ears in - they're a pretty snug fit and getting the DPA's in and out will be easier that way. And then my kids got a hold of her and asked to give her a makeover. I figured people would think I was plenty crazy for carrying around a mannequin head anyhow - at least this way I won't lose it. It's a 3/8" to 5/8" adapter. 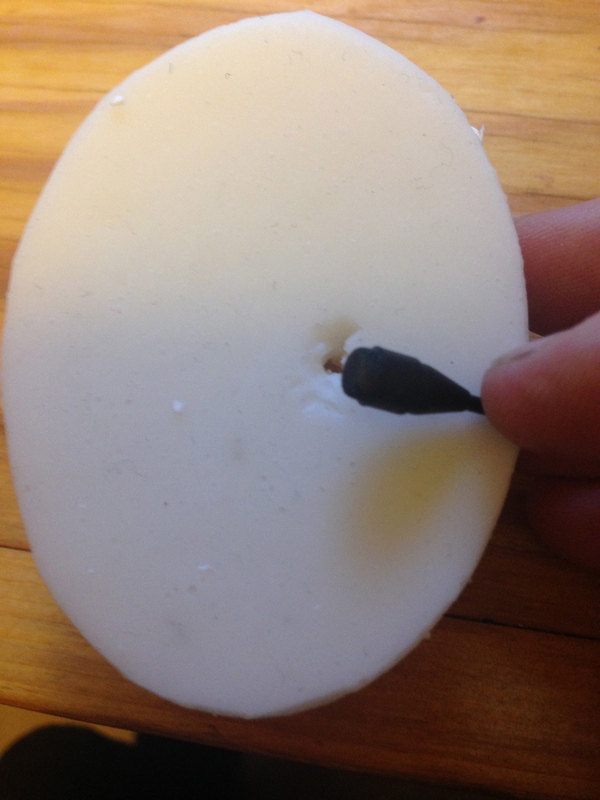 I've attached a heavy bead with a twist tie and wrapped around the end of the DPA attaching to the XLR connector to thread it through the head. Even so, it takes some doing to thread the microphone through. 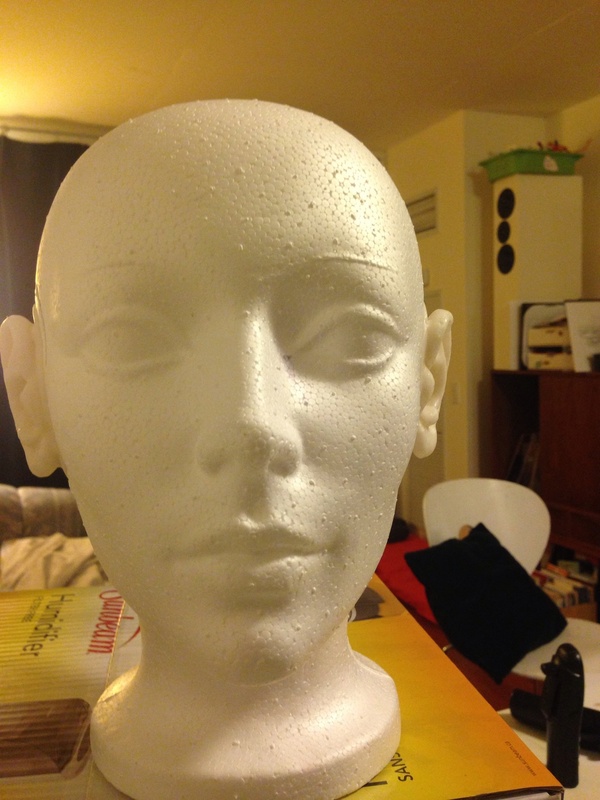 And voila, DIY binaural dummy head. Boom goes the sound designer. It's difficult to see in this picture, for the wheelchair POV shot, I asked the actor to wear two DPA 4060's hooked on his ears. I wanted the option, at the mix, to really put the audience in the wheelchair. I hope that shifting from mono dialogue/sync sound to binaural for this shot will help that. I guess I'll see. Or hear, rather. The awkward first post. I thought about starting this blog in medias res seeing as I am in the middle of my career but introductions and explanations are probably in order. My name is Adam Axbey. I am professionally, in about this order, a sound designer, mixer, recordist, composer, producer, writer and director. The aim of this blog is to focus on my adventures in the first four of my aforementioned fortes but I’m sure a sprinkling of the final three will appear throughout. Let’s drill down a bit on the goals of this blog. After fifteen years working mostly in post sound and more recently in game audio, I realize that I’m not really a significant participant in the audio community. I’d like to change that. I think that I’m also at an interesting crossroads in my career; as I’m well versed in all thing post audio I hopefully have some helpful tips and tricks to share there (though there’s always lots more to learn). But I’m less well versed in the implementation side of game audio, so I hope the mistakes I make here will garner me some constructive criticism, or at least some creative invective. TL;DR - I’m gonna be doing some cool audio stuff and post about it here, stay tuned if that seems like good times to you.